Many organizations are not gaining the potential benefits of teams in the workplace due to misunderstandings about team autonomy and self-control. This is a critical issue in organization design and leadership today. Let’s clarify both the benefits and the determinants of team autonomy. The organization is intentional about instituting teams at every level in all directions of the company. The everyday work is divided into teams with clear roles and responsibilities. All of these statements are true. The apparent contradiction can, however, create some confusion about the use of teams. Do Autonomous or Self-Managed Teams Exist? Many labels have been used to describe teams in the work place: high performing teams, self-directed, self-managing, autonomous or semi-autonomous, or self-sustaining teams. More simply… just work teams, work cells, work groups or management teams. My associates and I, over the past forty years, have trained many thousands of teams and team leaders in about one hundred companies. I can honestly say that in all that time I have never seen an absolutely self-managed team (or self-directed or autonomous). So long as there is a Board of Directors, the senior management team is not self-managed. As long as there is a plant manager, hospital administrator, or any other manager, front line teams are not self-managed. As long as there is a spouse… you’re not either! Terms such as “self-managed” are absolute and absolutes are never absolutely true. So, Mike Rother is right, there are no self-managed teams at Toyota, or anywhere else! But, there are degrees of autonomy or self-direction. 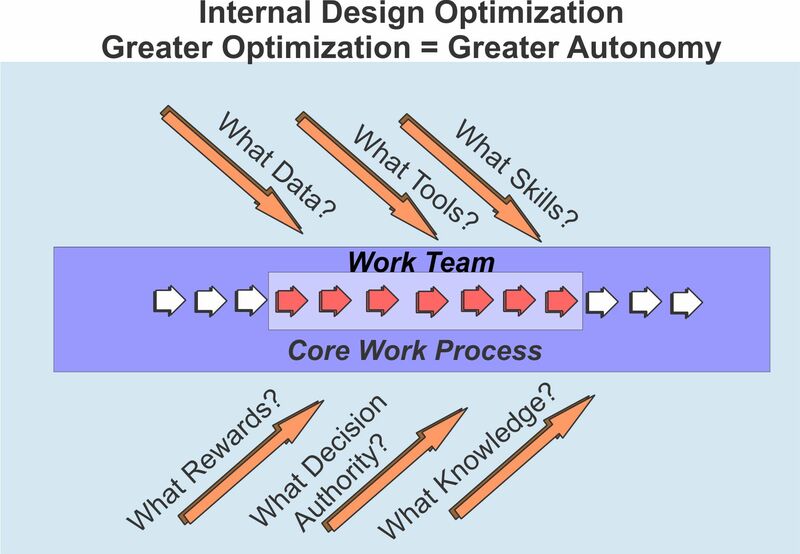 Why does team autonomy matter? It matters for several reasons and each of these reasons are tied to achieving a high performing organization. First, it is in our nature to move from the dependent relationships of childhood to the increasingly independence of adolescents. And then, to the interdependent relationships of maturity. It is demotivating, whether at work or in the family, to be restricted to a dependent condition. Dependence leads to helplessness, which leads to depression, which equals a lack of motivation. The infant is naturally motivated to crawl, to explore, and expand their circle of control. Authoritarian organizations assume the dependence of the level below, rather than encouraging their autonomy. By unnecessarily restricting autonomy they destroy the natural forces of motivation. Creativity, entrepreneurship and continuous improvement are all connected to degrees of autonomy and the acceptance of responsibility. If you feel dependent on the decisions of others you are less likely to think about ways to improve. If you believe in your own empowerment, or the self-control of your team, you are more likely to engage in the mental activity of thinking about ways to improve. Mastery and self-learning are linked to autonomy. If your job is to simply do what you are told, there is little incentive to either be creative or to seek mastery of current or new skills. A belief in your self-determination will increase your desire to seek self-mastery of those skills that will lead to your success. Complete freedom is the illusion of the adolescent. Complete autonomy for a team is an equal illusion. Because of both our own limitations and because of the environment, no individual or team is ever completely self-directed. This matrix is helpful in explaining the progress toward both autonomy and high performance. The vertical axis describes the degree of team maturity and skill. The greater the maturity and skill, the greater the justification for autonomy. The horizontal axis describes who decides and who solves problems. To the left, the manager decides and controls, to the right the team decides and controls. 1A: In quadrant 1A the manager recognizes that the team is not yet mature or lacks skills and she is directive and makes most decisions. If you leave the team in this quadrant you will lose motivation. This should be viewed as only an early stage of development for a team. 1B: In this quadrant the leader has turned over control to the team, but the team has not sufficiently matured to accept this responsibility. This is somewhat like the permissive parent who gives control to his teenage son who is not ready to accept responsibility. Poor performance is likely to result. Hold on to the car keys! 2A: In this quadrant the team has developed the skills and maturity but the manager won’t let go. This over-control hinders the development of the team and may result in the “rebellious teenager.” Teams may rebel against over control, but they will soon lose motivation. 2B: In the Northeast quadrant the team is skilled and mature and the manager has delegated decision making and a high degree of control to the team. Achieving this state of maturity results in a highly motivated team, rapid improvement cycles, and a reduced need (cost) for management doing non-value-adding work. The goal of development is to move smoothly from 1A to 2B. However, as every parent knows, developing a team to maturity, just like developing a child to adulthood, is rarely a straight line. There is always testing of control limits and failures to behave maturely. Rather than halt progress, these deviations should be viewed as inevitable experimentation on the way to maturity. As the skilled parent is “sensitive” to the degree of maturity of their child, the manager must be sensitive and respond appropriately to the maturity of their teams. It is a common mistake to assume “Well, they are a self-directed team, so I am not going to interfere!” This was one of the common difficulties implementing so-called “self-managing” or “self-directed” teams. It wasn’t the team’s, fault. It was the manager’s failure to accept responsibility for developing the team to accept responsibility and providing the needed problem-solving skills. Every work context is different and the degree of self-control assigned to a team must be based on the nature of the work and external dependencies. This is a critical dimension of team and organization design. The degree of control possible for a team on an auto assembly line versus an entrepreneurial software development team are entirely different. An auto assembly line presents those conditions in which the least autonomy is possible. A home health care organization like Buurtzorg may present those conditions with the highest possible degree of autonomy while still being part of a larger organizatoin. How is the pace and content of work determined by prior and subsequent teams? On an auto assembly line, from which a great deal of lean thinking has derived, there is a very high level of interdepence both in pace and content of work between each team. Team “B” in this illustration, cannot make a decision to increase their pace of work if the prior and subsequent teams do not also increase their pace. Similarly, the content of their work is also dependent. They cannot simply decide to add or remove tasks or parts without that decision impacting other teams. They are going to have a low degree of autonomy dictated by this external dependency. 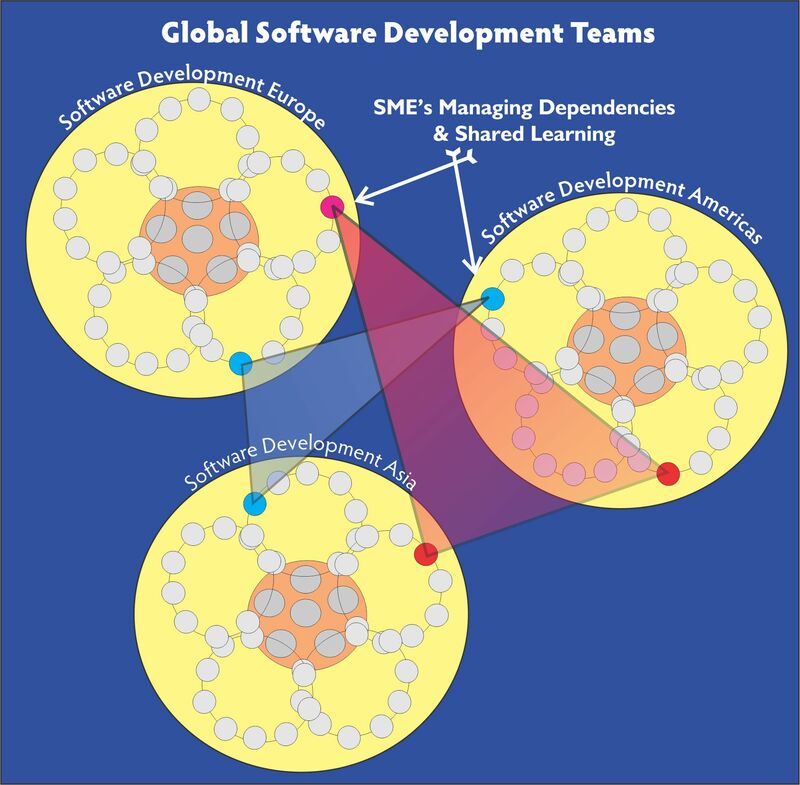 A contrary example is a software development team, or a group of software development teams, that may have some degree of interdependence. A group of high school friends who get together to develop an IOS app on the weekends can be very independent and self-directed. On the other hand a global accounting firm developing sofware for their global accounting clients may have teams working in different parts of the world. These teams may be much more self-directed than the auto assembly line, but they share dependencies, such as common software language, common clients, common accounting language and algorithms, for example. These teams may have subject matter experts to manage specific dependencies across teams. “Agile” software development teams are designed to be highly autonomous and manage their own pace of work, make rapid changes, and require little hierarchical decision making. Development of decision-making and problem-solving skills:Too often teams are not provided with the training to enable them to solve problems well. This may then cause managers to feel that the team is not willing to assume responsibility. The manager must distinguish between “can’t do” versus “won’t do” limitations. Selection of team members:Personalities can play a role in the success of any team at any level. This is one reason for engaging the team in self-selection of team members. This can enhance their acceptance of responsibility for each other’s success. Data presentation:Like athletic teams, all teams need data and the system must provide that data. Is data provided to the team in a visual manner, at a high frequency (hourly or daily?) requiring little administrative time? Tools:Are all the necessary tools available in the team’s work area? Complete skill sets to match the work:if you are designing a baseball team you know that the skills of pitching, playing shortstop, and other positions are necessary for the team to be successful. The same is true on any work team. Are these defined in the design? Decision Authority:What decision authority has been designed into the team process? Consider the responsibility of Toyota workers to pull the andon cord and stop the line. This is decision authority assigned to individual workers. It has a huge impact on how they think and feel about their work. Motivation Systems:What rewards and recognition are available to reinforce a team successfully achieving goals? Knowledge Access:What knowledge do they have access to that will enhance their work and decision making? Imagine the effect of Google search on almost every job. We can eliminate waste and reduce the need for reaching out or up, if we have access to required information. Optimize this access! You can probably think of other internal and external determinants of autonomy. As a leader in the organization it is your job to design the system to maximize motivation and continuous improvement. 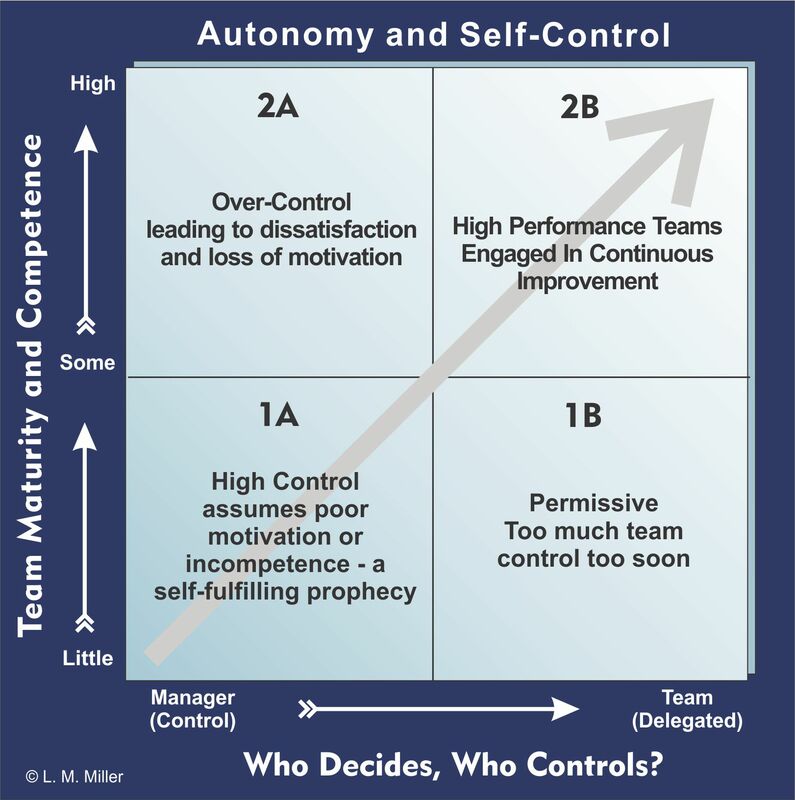 The degree of team autonomy and self-direction, while never complete, will be a major factor in the success of your organization.